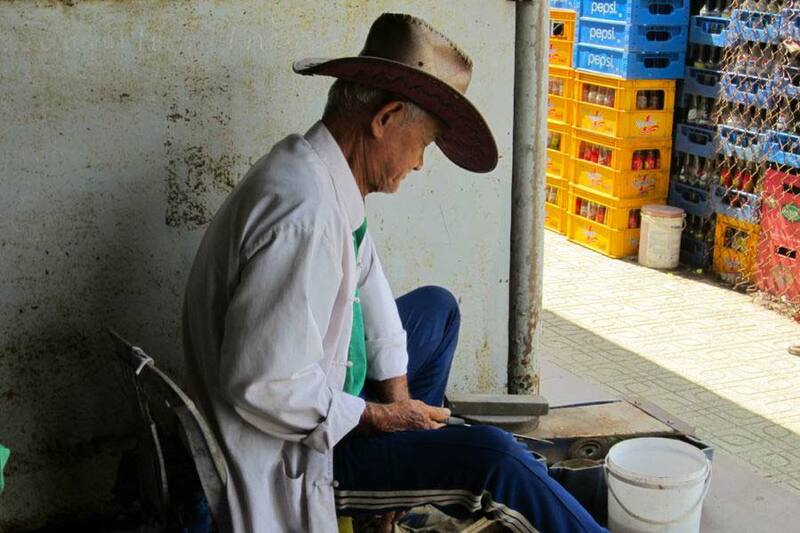 Home » Asia » Exploring Vietnam » Ben Tre, Vietnam: Tour-less in the Mekong Delta. From Ho Chi Minh City we took bus 39, a public transit bus from in front of Ben Thanh market to Mien Tay Bus Terminal for 4,000d/$0.20 (pay on the bus and make sure you have small, if not exact change). As you walk into Mien Tay station, avoid the people asking you where you are going and head straight for the ticket window. The prices are posted right there on the window so you won’t be ripped off. There are quite a few companies offering vans to Ben Tre, so shop around for the closest departure time. 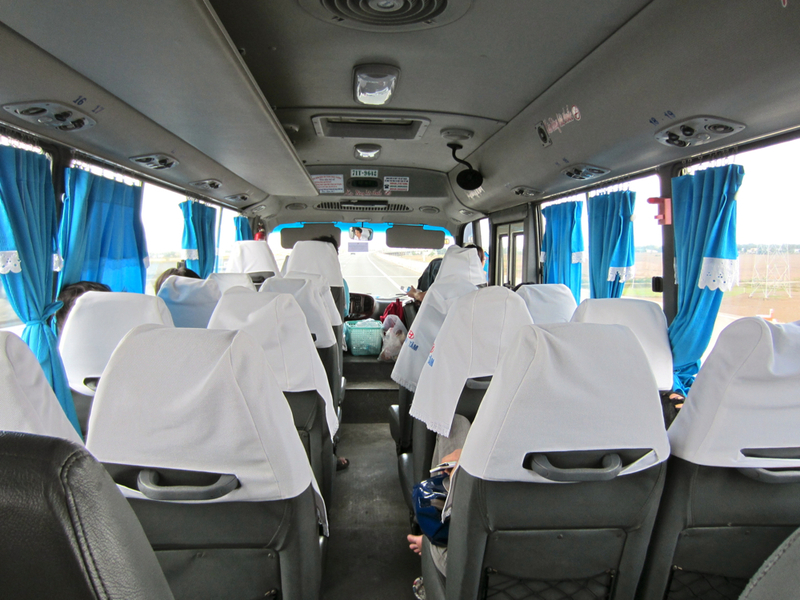 we took the minibus for 77,000d/$3.80. The minibus ride was quick and painless. It was air-conditioned and relatively empty so we had plenty of room to put our bags and knees. We arrived outside of the bus station where we were swarmed by the obligatory motorcycle driver and hostel owner/tour seller. I don’t know where they came from. Maybe they can smell a foreigner from a mile away. We needed to take a taxi to get to Oasis Hotel, and after telling the xe-om driver we’d prefer a taxi, one magically appeared two minutes later (100,000d/$5). 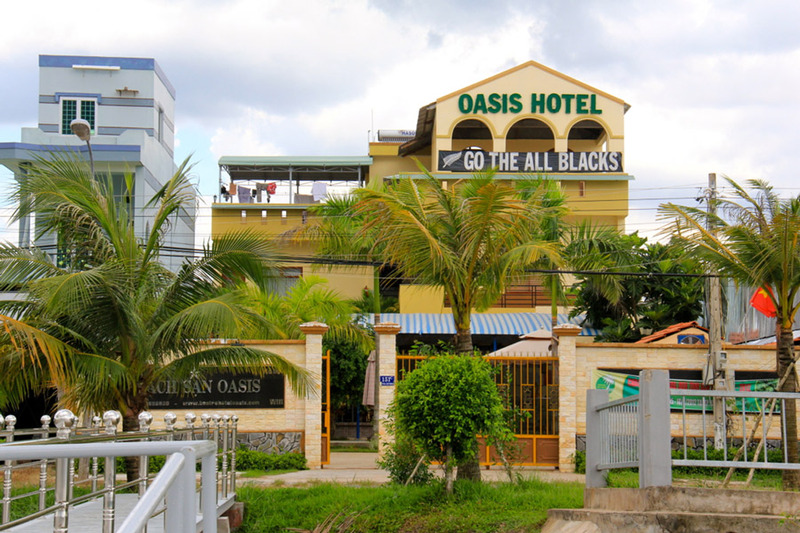 The Oasis Hotel (567,000d/$27 room per night for AC, TV, fridge, private bathroom, breakfast) was great and it was only a 15 minute walk to the town across the river. It is one of the most expensive places we’ve stayed, but the friendliness and helpfulness of the staff was worth it (plus there was a swimming pool!). There was only one restaurant close to the hotel, it was a little overpriced, but the serving sizes were generous. One of the noodle dishes we ordered could easily have served two people (65,000d/$3.20). We spent the first day by the pool relaxing and eating cornflakes. 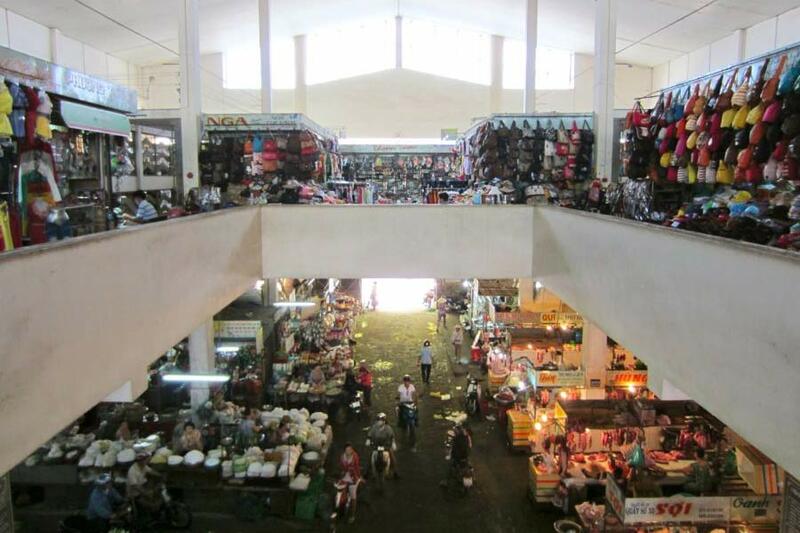 The next day we went to the market in the morning which was by far the cleanest one in Vietnam we had been to. 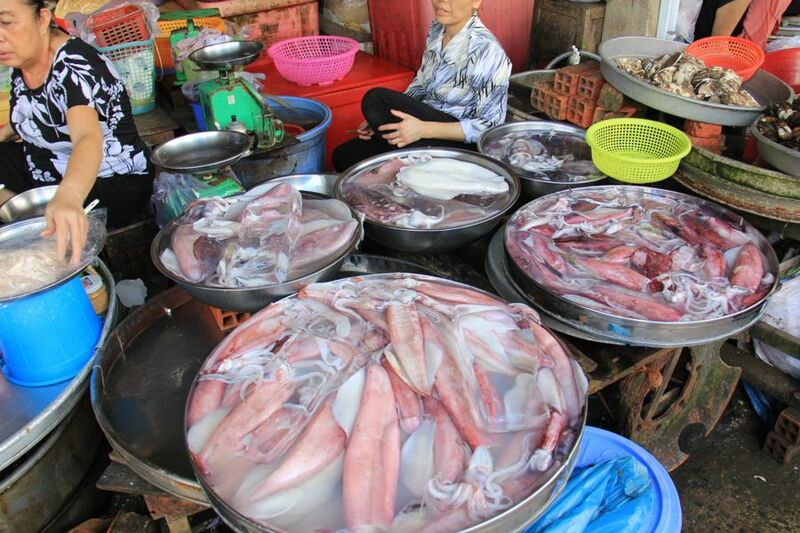 Everything was so fresh and many of the animals were still alive: fish, snakes, turtles, shellfish, and snails. There weren’t too many prepared food options for lunch though, so we bought some sketchy street pancakes and headed back to the hotel for a swim. 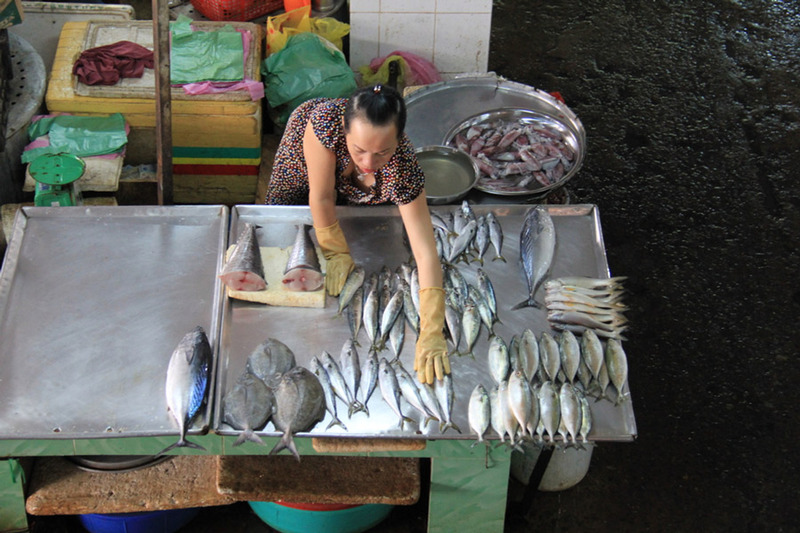 Fish for sale at the Ben Tre Market. The multiple levels of the market. After our swim, the family invited us to join them for lunch. Relieved that we didn’t have to eat our sketchy street pancakes, we jumped at the chance to indulge in a traditional home-cooked Vietnamese lunch. We had delicious freshwater fish, pork fried with garlic and an unknown flower vegetable. In the afternoon we took the route the hotel suggested to a nearby island by motorcycle. We rented our motorbike from Oasis Hotel for 80,000d/$4 for a half day. Red clay bricks along a country road. 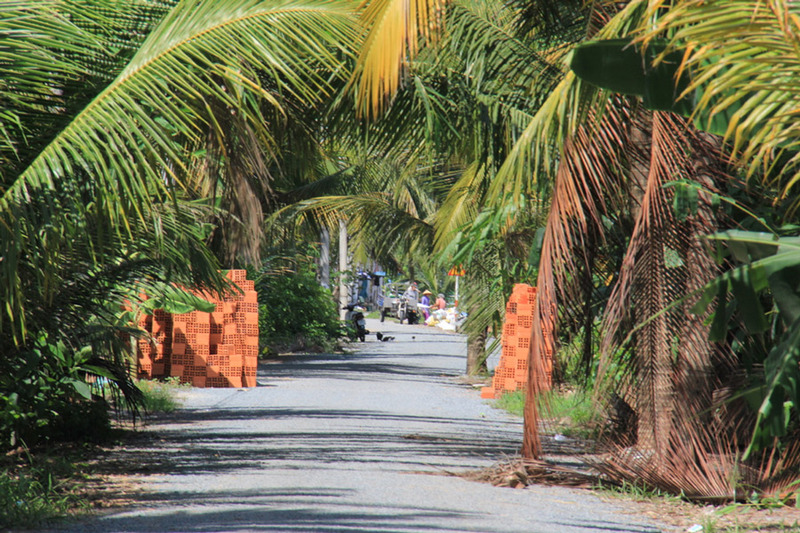 We took a left out of the hotel and rode along the river passing by a brick factory (which is open to tourists if you wish to see how they make the red clay bricks) and coconut plantations (Ben Tre is famous for it’s delicious coconut candy). At the fork in the road we turned right and continued along until we reached a T-junction next to a market building where we turned right to the ferry. The ferry goes across to the island every 15 minutes and costs 5,000d/$0.25 for two passengers and a motorcycle(!). The ferry driver poses for a photo. Once across to the island you have two options: ditch the motorcycle; or if your scooter riding skills are up to snuff, take on the narrow and rickety paths. We chose the latter, not knowing what was ahead of us. First, we went right until we hit a bridge that was a tree trunk, at which point we turned back and went the other way until the path essentially dissolved into forest. 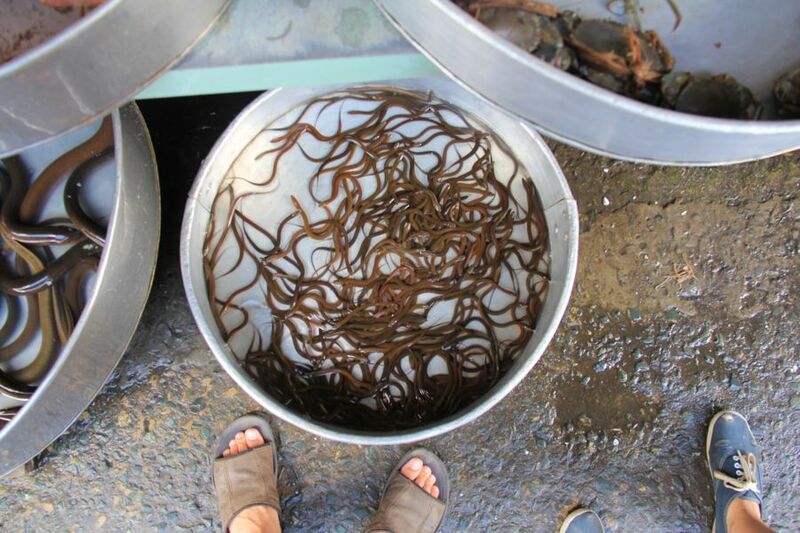 It was a very unique and authentic Mekong Delta experience. 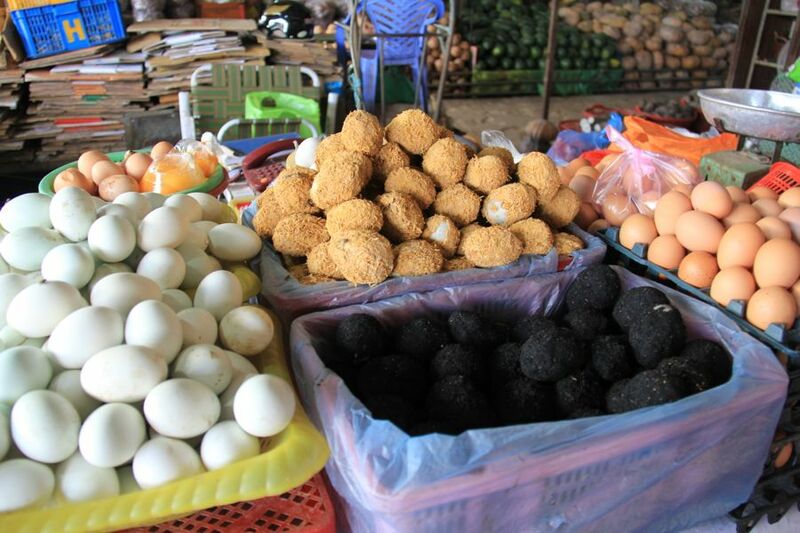 Ben Tre was a good stop for us, and it would make an easy day trip from Ho Chi Minh City. The market alone was worth the trip. 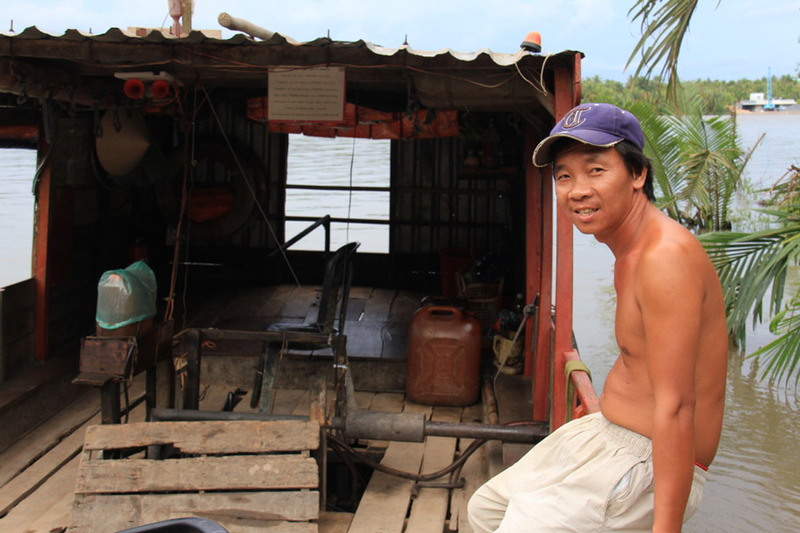 Our next stop is Vinh Long as we head deeper into the Mekong Delta. In the Mekong Delta, local buses rule. And that’s not necessarily a good thing. They are small and worn down. They don’t always drop you off at the most convenient locations, but they are cheap. An example: a bus from Ben Tre to Vinh Long costs $1, but it drops you off at the ferry terminal where you’ll have to take the ferry across the river for about 5 cents, then catch a motorcycle taxi to the downtown or walk the 3 kilometers (there probably won’t be any regular taxis around). Like I said, not the most convenient, but inexpensive (and a hell of an adventure). The bus station in Ben Tre is a bit out of town and we had a difficult time finding a taxi that wasn’t of the motorcycle variety. That being said, there is one company that will actually drop you off at your hotel: Thinh Phat, which leaves from Mien Tay station — ticket booth 20 (or if you prefer district 5 head to 25A Su Van Hanh). It costs 75,000 VND. The buses leave every hour starting at 7AM. 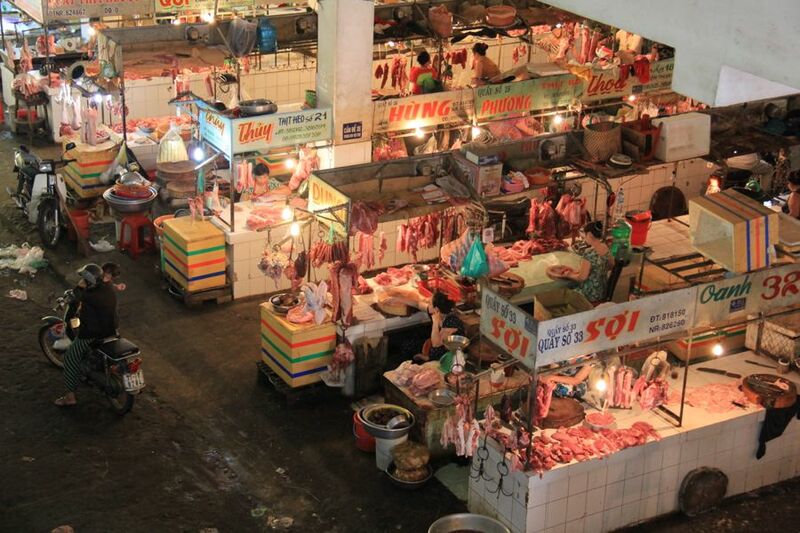 This company is your best bet if you’re coming from Saigon. If you do end up at the bus station, it’s probably possible to get a local bus from the station into the center of the city. Please let us know in the comments if you know for sure. 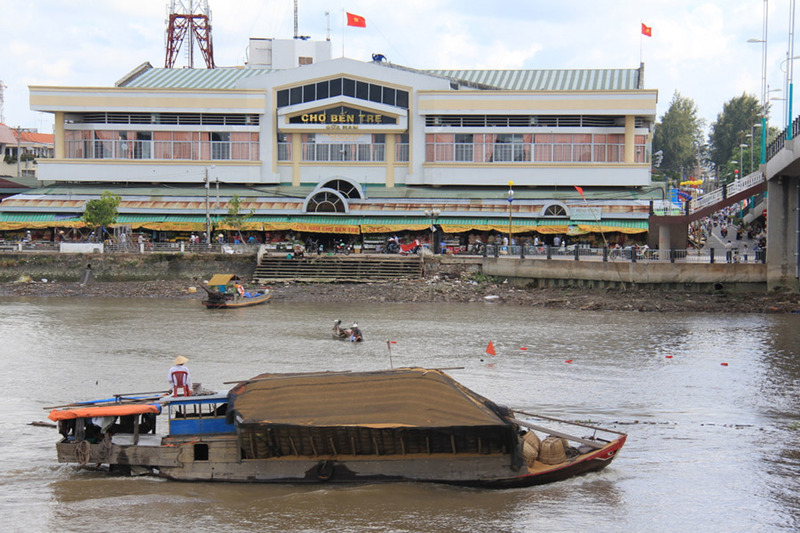 Hung Vuong Hotel is right on the river, close to the action. The rooms have everything you need and cost about $20 for a double room with a view of the river. 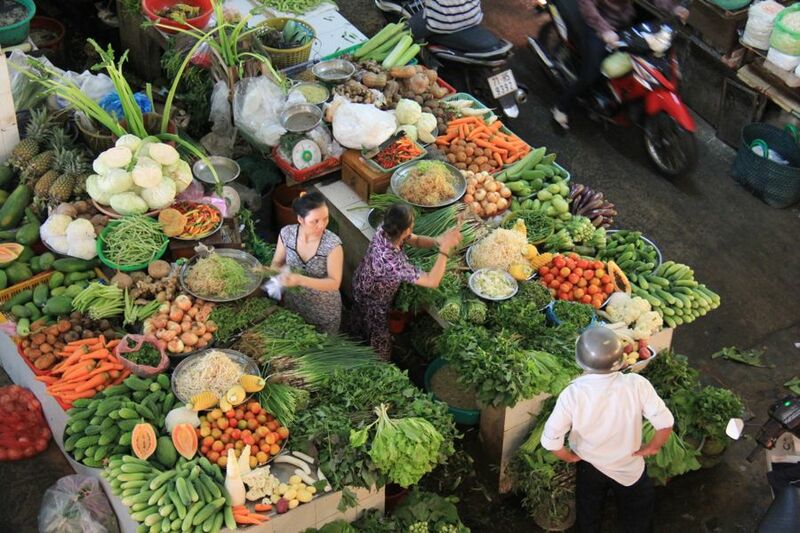 It’s only a 3 minute walk to the market, the highlight of Ben Tre, Vietnam. They have a restaurant on site, and your stay includes breakfast. If you don’t mind spending $5 more, you can get a room at the Oasis Hotel. It has a nice pool, very friendly staff that speak English, and you can rent a motorbike from them for a half day to explore the countryside. They suggested a nice route for us to take that had us seeing the highlights of Ben Tre. 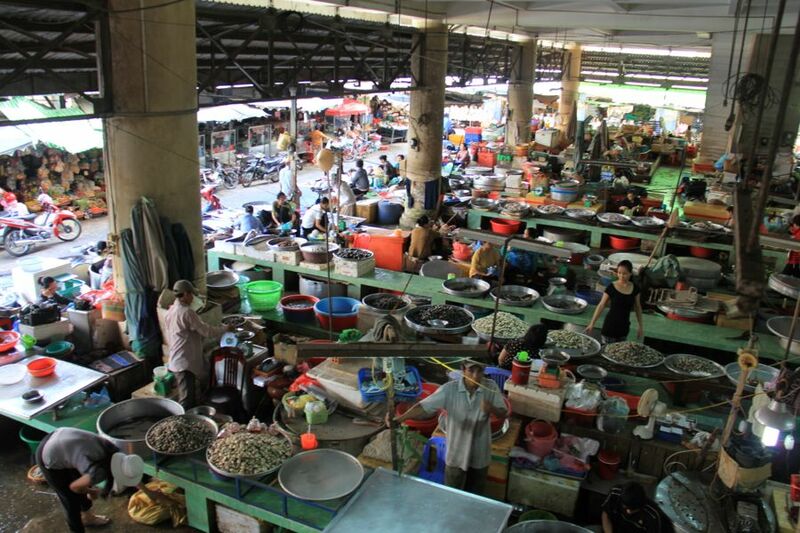 The hotel is about a 20 minute walk to the market. It’s actually difficult to find a good place to eat in Ben Tre, Vietnam. 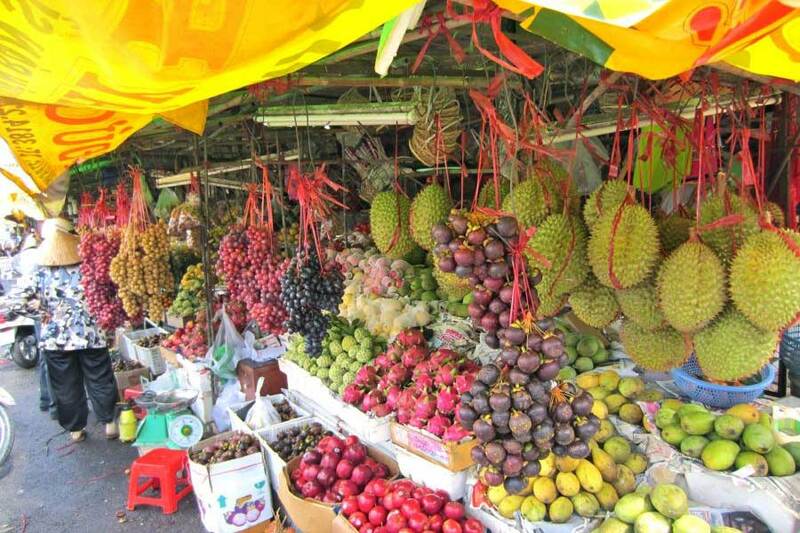 The market has a few stalls that will satisfy you for an early lunch. 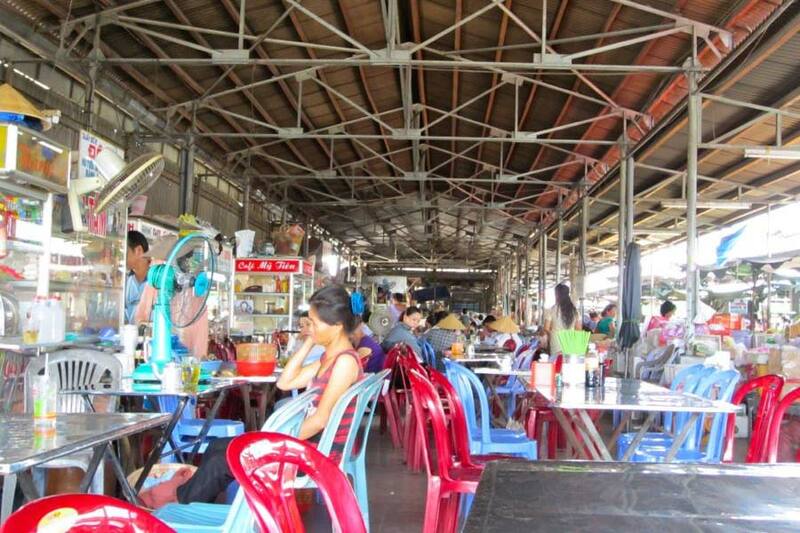 The restaurants along the river are mostly expensive for Vietnamese standards. There’s a pho place that’s pretty good at 68 Phan Ngoc Tong. Just south of that you can head to Cô Mười to get Bún Mộc, Hủ Tiếu, or Phở Gà. You can get some tasty duck rice porridge soup (like a congee) at Tuyền (9/2 Nguyễn Trung Trực). For chicken you can try Ngọc Hảo (30A Tan Ke), which cooks their birds in a clay pot over an open flame. For something classier, try Trúc Giang Restaurant at 26 Lê Đại Hành. Even though Vinh Long is closer, it makes more sense to go to Can Tho first. From Ben Tre, there will be more bus options and it will probably save you from having to get a moto-taxi from the highway outside of Vinh Long. Buses leave from the station every hour starting at 8:30AM and ending around 1:30PM. The costs is around 70,000 VND. Sounds like you had a nice time in Ben Tre. I did a tour a few years ago and it was definitely jam packed with activities, but incredibly cheap. You guys are brave to have done it on your own, but I’m sure you saw a lot of the more non-touristy areas. Kudos! Wondering if you could spare 2 seconds to check out my photo. It’s a finalist in the Conde Nast contest. If you could vote and leave a comment, that’d be great. I’d love to get my fellow bloggers involved! Thanks much! Hey, You are the best driver :D.
Nice video, i can hear the wind blows, see the small path surrounded by a lot of green trees, and feeling so relaxed!! !